Oil on canvas, 50 x 38 cm. With a watchful gaze, an Italian shepherd boy observes the viewer while holding his shepherd’s crook with a firm grip. A clear blue sky and towering mountain slope form the background. 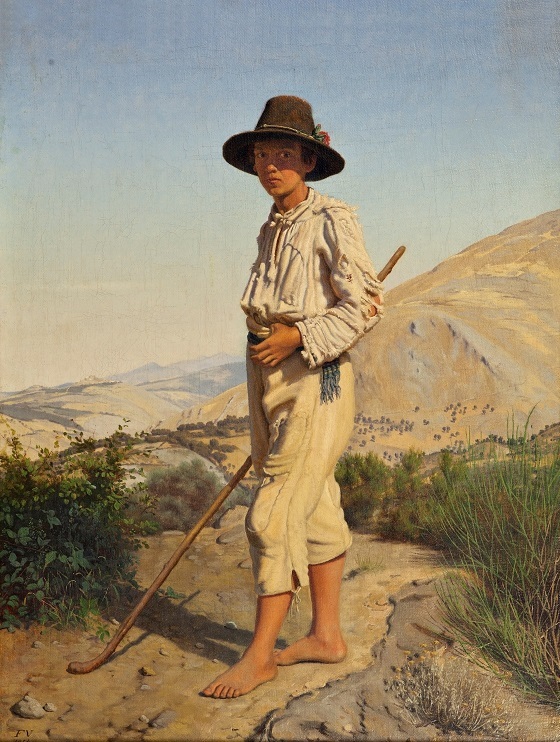 The shepherd boy occupies a prominent position in the foreground, while the scenery in the background underscores his identity as that of a shepherd living in harmony with nature. The artist has therefore structured the composition of this painting with the boy as the central subject. The painting was completed in Rome following a number of studies Vermehren had done in Gerano. However, the portraits reveal a clear inspiration from Jørgen Roed’s earlier depictions of the Italian pastoral life as well as Constantin Hansen’s painting A shepherd boy from Pompeii, which also featured a shepherd boy as the main subject. Vermehren exhibited a painting of a shoemaker at Charlottenborg Exhibition Hall in the spring of 1847. The honesty of his unadorned depiction of normal everyday life was central to Vermehren’s output. The national romantic conception of art that reigned in this era led many artists of the day to heed N.L. Høyen’s desire that they portray the life of the common people. The fishwives, sowers and other figures from peasant life depicted by Vermehren are beautiful examples of this. As a teacher at the Academy of Fine Arts, Vermehren was not blind to the aspiration among artists of this era to achieve greater realism; nor was he oblivious to the talent of the artist P. S. Krøyer. As a national romantic painter of everyday life, Vermehren himself remained, nevertheless, a firm believer in depicting situations. The people and environments he depicts are frozen in a timeless state, something which has frequently led to his paintings being used to illustrate for example reprints of Steen Steensen Blicher’s short stories. However Vermehren was never an outright realist in keeping with the style of the French Realist movement.